Toritos for good luck in Atuncolla. Our journey in Peru started around one of the most bewitching places in South America: Lake Titicaca. As usual I had a general idea of the places I wanted to visit in Peru; also, as usual as well, we got a couple of surprises on the way. Peru’s Lake Titicaca turned out to offer much more than just a stop in Puno and a visit to the floating islands. After 10 years Coen and I continue to share the passion for finding hidden corners, off-the-beaten-track places, and enjoying moments of pleasure when we stumble upon such a treasure. As a result, our ‘planned’ (or should I say, ‘expected’) two-day, straightforward trip to Cusco turned into a brilliant five-day exploration. There is still a feeling of excitement when entering a new country, even after 10 years on the road and having visited 30 countries. It takes a couple of days to get the feeling of a country: the energy, the ambience, to interpret the faces of people, to learn the nuances of the language. Going slow is a great way to do exactly that. 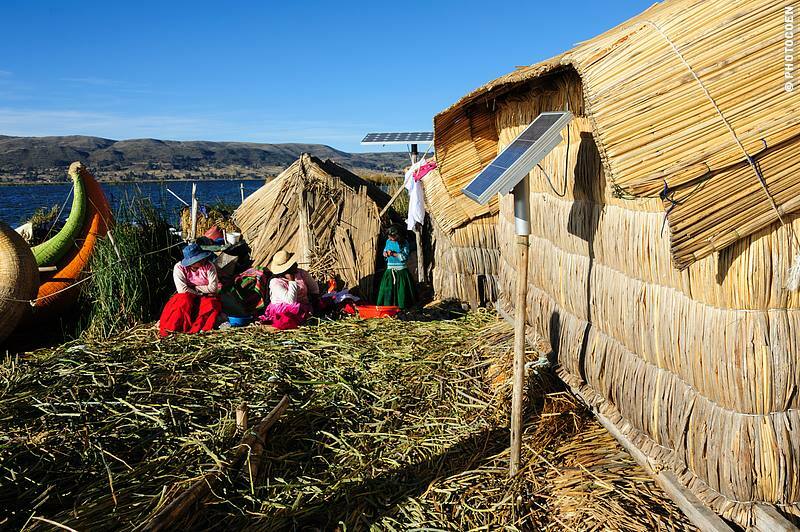 Visiting the floating islands of the Uros obviously came from a guidebook – all guidebooks talk about this. But from where to visit them, Llachón, was a tip we got years ago from other travelers, which I had jotted into a notebook. We came across the chullpas around Cutimbo by just driving around, feeling intrigued by the landscape and driving up a hill to see if there was anything of interest. The lunch at Prudentia’s house in Atuncolla was the result of Coen walking into the countryside, wanting to take a picture and meeting this extraordinary woman. And so our Peruvian journey started in a fantastic way. Here are the places we visited or stumbled upon. I invite you to go there and check them out. Do you know places around Lake Titicaca worth sharing? I’d love to hear about them in the comment section below. This church was one of our favorite attractions around Lake Titicaca. In a town numbering about 1,600 inhabitants stands a glorious, red sandstone church built by the Dominicans in the 17th century. It immediately got our attention and if we kept lists, it would end in the top ten of churches we visited in South America. The church has an intriguing mixture of austerity and decoration. Due to the small windows, it is rather dark and so the first impression is one of sobriety. However, the interior is spectacular with intricate, baroque carvings all over the place. The windowpanes around translucent alabaster windows have been carved, just like parts of the ceiling and walls.There is a carved condor on the ceiling of the altar and a carved copy of the church on one of the walls. The dome depicts a circle of dancing figures and the four corners below it show different figures together with carvings of vases and flowers. A carved condor decorates the ceiling of the altar, and a carved copy of the church features on one of the walls. The dome depicts a circle of dancing figures and the four corners below it show different figures together with carvings of vases and flowers. Dancing figurines in the dome. Also the outside has beautiful carvings. One of the side altars attracted my attention. Here stood a saint on a stone structure that was carved by Lucas Sanches – his name is barely readable at the bottom. He fabulously sculptured an overview of all the tools needed to build this church. I loved that detail. The garden behind the church, unfortunately, functions as a public toilet but it did offer a grand view of Lake Titicaca as the church stands on a hill. I sat with my back against the wall of the church, in the sun – happy with the minimal breeze – as I took in the view of the cobalt-blue lake with snow-capped mountains as a backdrop. The world was silent except for the twittering of birds and the humming of a couple of insects around the bright yellow flowers. Life was perfect. Pomata lies some 25-30 kms west of Copacabana, on Lake Titicaca’s southeastern shore (along Ruta 35 to Puno). I assume the church is open every day as there is a caretaker and we paid a minimal entrance fee. Days of particular interest are July 25 when the villagers have a festival celebrating Santiago, patron of Spain, and October 1, when the villages have a grand procession and celebration to honor Virgin de Rosario. The windswept, undulating landscape west of Puno is characterized by table-topped volcanic hills, some of which feature chullpas, cylindrical and square shaped burial towers that date from pre-Inca (Colla and Lupaca) and Inca times. We drove uphill after we spotted the remains of such a funerary tower. It brought us to an archaeological site although it wasn’t promoted as such. We walked through tufts of yellow grass dotted with ruins of towers until we came upon one chullpa that was completely intact (except for the body and treasures that had been removed, of course). Behind one of the chullpas shone a half-moon against the bright-blue sky, which added to the atmosphere. I have never wanted to be buried, finding the thought too claustrophobic. However, I can imagine being laid to rest here, atop a hill with the protection of a stone tower. It seems like the perfect place to set your soul free. We found the above-mentioned chullpas along Ruta 32, some 20 kms southwest of Puno. There is a site called Cutimbo, which charges an entrance fee but there are other hills where you can just drive up and take a look without paying. The best examples of chullpas are on the site of Sillustani, northwest of Puno. I recommend visiting it as this burial ground is extraordinary with different types of funerary towers. In the hamlet of Atuncolla many houses are characterized by a pair of ceramic stone statues of happy or surprised looking bulls on their roof, often decorated with paintings and beads around their neck. Coen wanted to take a picture of them and asked permission from somebody who was walking in the field next to a miniature compound. Thus we met Prudentia. She asked if we wanted to have some chuños – freeze-dried potatoes – with cheese. Of course we did. We followed her through the stone gate into the courtyard that was surrounded by adobe house and storage spaces. Prudentia has lived here all her life, spending the days in the fields, tending her alpacas and llamas, and showing visitors around. Prudentia showed us a variety of bowls with grains that grow here, demonstrated her tools, among which a stone slab on which she grinds her food and herbs with a rock, and pointed out plants used for medicinal purposes. She said that while toritos – as the ceramic bulls are called – are for good luck, they have crosses as well to ward off evil. It was clear more visitors stopped here. At the entrance of the village I had seen a sign saying “Turismo Rural and Vivencial” (Rural and Experiential tourism). Sometimes tourism promoted in such way may give a tacky feel to a place, or locals start harassing to sell stuff in order to make a buck. Here, there was nothing of the sort. The chuños were tasty and we ate them with bites of the queso fresco – fresh cheese. It was so good that we happily bought a chunk of that cheese. In the days to come it was a perfect addition to our pasta with homemade pesto meals that we tend to live on when on the road. Atuncolla lies on the road to the chullpa ruins of Sillustani, northwest of Puno. In the late afternoon light, the Peninsula of Capachica radiated stupendous beauty and sublime peacefulness. All around us Quechua-speaking, homeward-bound locals were tending their sheep, sometimes carrying their babies tucked in a woven blanket on their back. Most wondrous are hats of the women, which from above appear to have the shape of a kite. There are two cotton pompomps attached to the top. The women wear multi-layered skirts and some wore a beautifully embroidered vest or sweater. Despite the presence of electrical cables and the occasional satellite disk, being here felt a bit like a time-warp back into time, into a to-the-western-world almost ancient agricultural world that appears so scenic from the outside but which must be harsh to live in. Many of the hills are terraced, a system of agriculture date in some places is as old as the days of the Incas. Some farmers were harvesting or preparing the soil and the whole atmosphere radiated tranquility. No wonder with that forever-blue Lake Titicaca bordering their homes, hemmed in by mountains and hills, with in the distance the island of Taquile and, at the farthest point, Bolivia’s snow-capped Cordillera Real. Llachón lies on the Peninsula of Capachica, some 75 kms northeast of Puno. You can get there by public bus or on an organized tour from Puno. There are tourists but not many. Accommodation is mostly provided in the form of Bed & Breakfast kind of places and hostels. Uros people don’t just live on islands, but on floating ones which they build themselves. The product they use is torora reed which grows in the shallow parts of Lake Titicaca. We spent a pleasant couple of hours there. Women explained to us how they build and maintain their islands, houses, and beds, all made of the same reed. This is an ongoing project as the reed rots at the bottom and needs to be replenished from the top. Modernity has penetrated the island and they were proud to show how they could turn on a lamp, now that they have electricity thanks to solar panels. We were welcomed into their homes, chatted and laughed and checked out their handicrafts. Here is more about our afternoon on one of these Uros islands. Puno is the most common gateway to visit a Uros island. 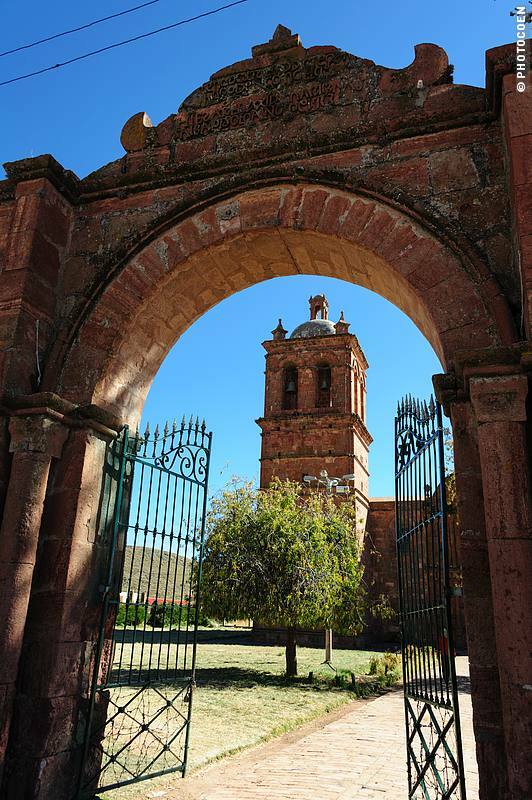 No doubt the trip from Llachón is just as touristy an affair, however, I suspect that when coming from Llachón you share the pleasure with fewer tourists than when going from Puno. In case you like a quieter affair, pick Llachón. Here, any owner of accommodation can arrange a boat for you to visit a Uros island. As an ambassador for Insight Guides, I recommend checking out their series – there’s one on Peru. Enjoy more stories about Peru here or find them on our Landcruising Adventure website. Where to Learn All About Che Guevara? This entry was posted in 5 Slow-Travel Destination Series, Peru Travel, Sightseeing by Karin-Marijke Vis. Bookmark the permalink.